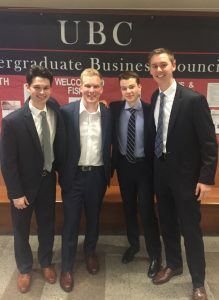 A team of FMI Scholars took first-place honors at a stock pitch competition at Ohio State University. The event was sponsored by Buckeye Capital Investors on April 1, 2016. Jamie Carlstedt, Thomas Chadwick, Michael Metz and Palmer Pawlusiak pitched KAR Auction Services. The students all participate in the Security Analysis class taught by Prof. Stephen Schiestel in which they manage a multi-million dollar fund on behalf of the MSU Foundation. They were aided in their preparation by FMI advisory board member Alec McAree. A team from the University of Michigan took second place.